The movie, that is. 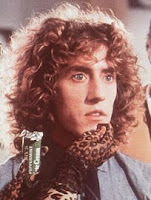 The Who’s Tommy (1969) is, of course, the band’s acknowledged masterpiece, even if the story line is slightly incoherent. The inclusion of a couple songs by John Entwhistle doesn’t help, either, but in any case the music is outstanding, and Keith Moon’s drumming exemplary. Filmed in 1974, the Ken Russell-directed film of Tommy was released in March 1975. According to an article in today’s L. A. Times, this evening there is a special 35th anniversary screening of Tommy at the Samuel Goldwyn Theater featuring a new digital cinema presentation of the film with the original “Quintaphonic” soundtrack. According to the Times article, Tommy was the only film ever produced using that particular stereophonic sound system. After a short web search, I found on the forums at quadraphonic.com that “Quintaphonic” was a quadraphonic stereo soundtrack with a third track added for dialogue. For those wishing to hear the soundtrack in its “Quintaphonic” form (minus dialogue), the version of the soundtrack that has Roger Daltry as Tommy on the cover is purportedly a Quadraphonic stereo release although not indicated as such, or at least the Japanese CD released a few years ago on Polydor is Quadraphonic. Perhaps every release of the movie soundtrack is in Quadraphonic, but I am unable to say. I’ve excerpted a few of Pete Townshend’s comments on the film below; the full article is available at the link above. In my view, Ken Russell was the only director capable of making the film, and it certainly ranks among his best films, Women In Love in my estimation being his greatest film, with The Devils close behind. Was it your decision to bring Tommy to the screen? How did you select Ken Russell? For years I was against doing Tommy as a film. I felt a film would reduce the impact of the music and make demands of the story to which it could never rise. . . . The first I knew that Ken Russell was on board was meeting him in Wardour Street while recording sound effects for Quadrophenia and his directorial role on Tommy seemed a done deal. What was your and the rest of the cast's relationship with Russell? Ken was bombastic, energetic, funny, tireless and inspiring. He had an obsessive eye for detail and planning that I now realize every great film director needs, or in its place the absolute certainty that they can accept what happens when it happens and adapt to it. I never had a bad moment with Ken. . . .
People, including Murray Lerner who is hosting the Tommy event, said watching the rock opera live was akin to a religious experience. Do you feel the film captured that feeling? The original Tommy album was intended by me — from a composer’s standpoint — to provide the Who with a powerful live piece that would extend what I had done for the band with “A Quick One While He’s Away” — my first mini-opera. My interest in the Indian master Avatar Meher Baba and a fair bit of reading by Sufi authors and mystics at the time of the writing inspired me to try to create a musical piece that provided a spiritual travelogue through the so-called “planes” of consciousness. My deaf-dumb-and-blind hero was a cipher for those of us who are unaware of our spiritual life, either by choice or ignorance. . . .
Would you discuss the casting of the film, which includes such Russell veterans as Oliver Reed but such Hollywood types as Ann-Margret and Jack Nicholson? There is where I hang my head in shame. I initially disagreed with all three of these choices. My arguments were with both Ken and Robert Stigwood. Robert was the most persuasive, explaining the Hollywood star system to me in words of one syllable: “We have to have them.” . . . Roger worked really hard. I was deeply impressed by his professionalism as an actor. He seemed to be a natural. It was through performing in the role of Tommy with the Who that Roger discovered his ability to be a true frontman in a rock band. He almost invented the pseudo-messianic role taken up later by Jim Morrison and Robert Plant. Criterion’s announcement that it is issuing in August a Blu-ray edition of Marcel Camus’s Black Orpheus should remind us of how the bossa nova came to America. Released in the United States in December 1959, Black Orpheus made the composers of its soundtrack, Antonio Carlos Jobim and Luis Bonfá, internationally famous. The film’s main themes, “Manha de Carnival” and “O Nossa Amor”, have been covered countless times over the decades since. The bossa nova—from the Portugese, bossa, meaning “trend,” and nova, meaning “new”—combined cool jazz harmonies and pop melodies with a samba rhythm. The bossa nova was initially popularized by João Gilberto on his 1959 album Chega De Saudade. His individual guitar style and the hushed, casual lilt of his vocal delivery defined the musical form and altered the course of popular music history. The music soon became the de facto soundtrack of any European film made in the 60s that considered itself cool and bohemian. In 1961, the Kennedy administration sponsored jazz guitarist Charlie Byrd’s “goodwill” tour to Brazil. Upon his return to the United States, Byrd along with Stan Getz recorded the hugely popular Jazz Samba (1962). 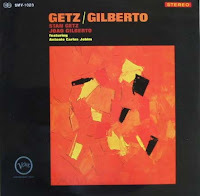 But perhaps the biggest hit, and one immediately identifiable with the 1960s, is the Getz-Gilberto hit, “The Girl From Ipanema” (1964), available here. Predictably, many dozens of pop albums influenced by the bossa nova were released. The Brazilian word suggesting the emotionally detached mood sometimes associated with cool is saudade, which may explain why for many people the bossa nova is sometimes confused with so-called “lounge” music, and both are confused with cool jazz. In 1963, Eydie Gorme released “Blame It On the Bossa Nova,” which became a huge hit. What’s the bossa nova? Why, it’s “the dance of love” according to Eydie Gorme. How to dance it? Why, you just march in place and swing your hips. 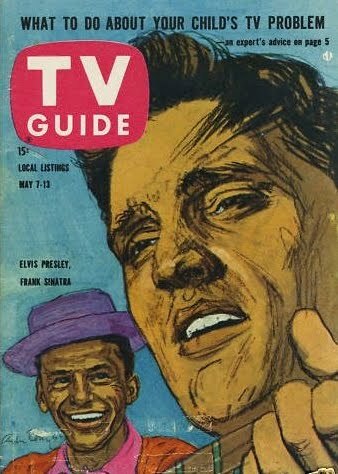 Astonishingly, according to Dr. Nichopoulous, the autopsy revealed that Elvis’s colon was 5 to 6 inches in diameter (in contrast to the normal width of 2-3 inches) and instead of being the standard 4 to 5 feet long, his colon was 8-9 feet long. 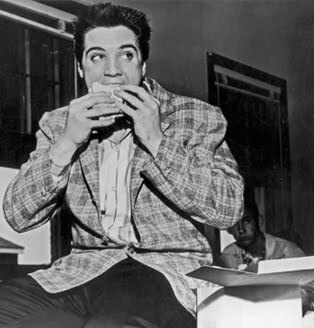 Actually, the issue of Elvis’s dietary and bathroom habits was explored about twenty years by the enormously unpopular (at least to Elvis fans) Albert Goldman, in his book, Elvis: The Last 24 Hours (1990). Goldman discussed in detail how drug intake would have led to chronic constipation. The full Fox News article is available here.